My boys went hiking on Table Mountain this past weekend so Mela and I had all of Saturday and Sunday morning to ourselves. After dropping the boys and some of their scout buddies off at Table Mountain I went down into the city to visit some camera stores. Although it’s been almost five years since we moved down here I haven’t been into the city centre before so I got a little lost but eventually found my way to a parking garage that was situated between the two stores I planned to visit. On my way to the first store I found a bargain book store and bought a few older British photo mags at really cheap prices. I was actually visiting the camera stores to buy a 58mm to 5mm step-down ring but ended up coming away without one, but with a monopod and a photo backpack. I took Mela for lunch at The Orchard in Grabouw and we continued on to Hermanus. Looked around the flea market briefly then went down to the cliffs to see if there were any whales about. 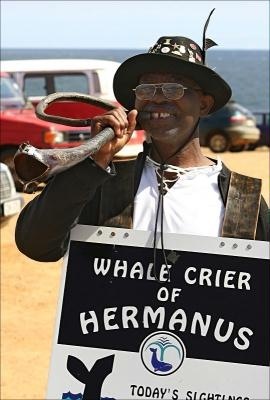 There weren’t but we found the whale crier. He told us that he had spoken to people at Die Kelders in Gansbaai, across Walker Bay and that there were many whales there. We drove the further 45km there and sure enough there were about 10 whales there quite near to shore. They were jumping quite a bit and I took some photos but even with my telephoto lens they were just a bit too far away for decent photos. Mela fancied tea and cake so we thought we would stop in Hermanus for some on the way back but when we got there at 6pm we found that the tourists had all gone home and the coffee shops were either closing or already closed. Instead we stopped at the Spar and bought a chocolate cream cake, took it home and made our own tea to have with it. All in all it was a very enjoyable day but it was a bit much for Mela and she felt pretty lousy on Sunday. This entry was posted in Photos, Thoughts and tagged gansbaai, grabouw, hermanus, whales. Bookmark the permalink.